Almost half of 2016 has come and gone, and before we know it, we will be staring at an event packed June right in its eyes. Sell in May and go away has proven to be a viable option for traders, as we and other analysts have warned of trendless but volatile markets. May was generally skinny on major market events but June will not be the same. The summer of shocks might have begun for real. With the passage of both the April FOMC statement and rate decision, and the subsequent publication of the April FOMC minutes, markets have gotten even more unpredictable and have been behaving ever so wildly. We have a feeling that many participants are confused, and so are we. As such, we generally prefer to remain liquid, taking only shorter term trades and riding out medium term volatility by having few to no positions in that time spectrum. In times like these, having no position is a position in and of itself. Today being the first day of June, and the start of the last month of the first half of 2016, we thought it would be aptly appropriate to list down some of the biggest event risks that June will bring. These are the known unknowns — uncertainties which we already know about but not their outcomes. The biggest risks in June (in our opinion) will be the EU referendum by the UK in the later part of the month, the June ECB monetary policy decision and press conference, the June FOMC statement and interest rate decision, and lastly the BoJ's monetary policy decision. As you can already tell, besides the UK vote on its European membership, most of the key event risks orbit around central bank policy. "New opinion poll results surfaced in Britain Tuesday showing a 47% vote for leaving the EU (Brexit), and a 44% vote for remaining in the EU (Bremain). The news sent GBP crashing 130 pips against the USD and shockwaves across risk markets will global indices all down on the day and for the week. While such poll results are questionable, the consensus is that the Brexit vote is quickly catching up to the conservative. 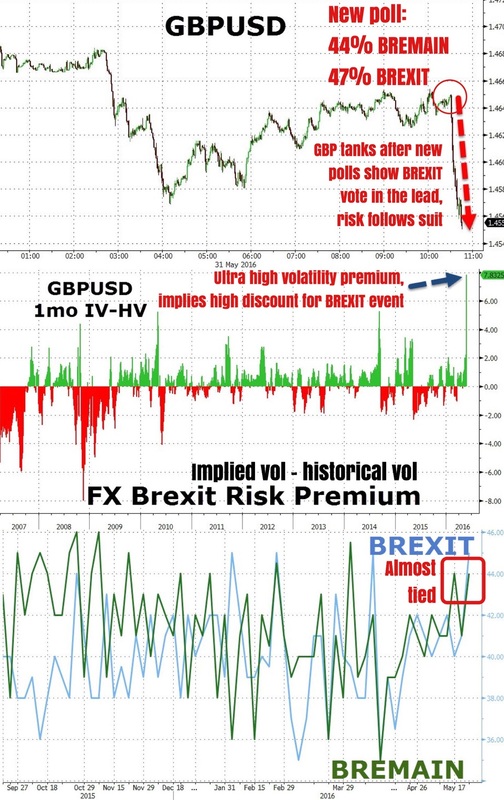 Regardless of results, the UK referendum is surely one of (if not the most) the nuggets event risks in June and markets will likely continue to trade wildly on every ebb on this event." We feel markets will likely be most sensitive to these types of events, having chopped around for almost half a year now. There is great anticipation for guidance on where to go next, and we feel markets will likely take cues from central banks, chiefly the Fed. Year to date, returns across the spectrum of global financial assets have been abnormally dispersed. This might be the market's signals to us that no one really knows how to position for the medium to longer term. And we won't pretend to know it all either. Until we get more clarity on where the major central banks are likely heading with their respective monetary policy stances, we expect this environment to continue as the mainstay. May was a month of decoupling: oil decoupled from the dollar, and global risk decoupled from the once again sharply devaluing Yuan, but most notably May was a month where Fed rate hike expectations repriced midway through the month. Markets largely took the move in their stride and reversed a difficult start to the month. Having said that we saw evidence of the repricing with dollar strength and EM/Gold weakness a theme. In fact for equity markets in particular the old adage ‘sell in May and go away’ was looking relatively apt for the first week or so into the month before sentiment turned positive, seemingly supported by a combination of increasing comfort that the market can accommodate Fed tightening, higher oil prices, positive news from Greece and another decent performance for European Banks. Looking at the winners and losers for the month one thing which stands out is the relative performance between local currency performance and US Dollar hedged performance during the month such was the strength of the Greenback. That was certainly the case with equity markets where in Europe in particular markets were generally up between 1-3% in local terms with banks in the middle of that range. With the Euro weakening 3% during the month however, on a USD return basis we see most European equity markets finish flat to slightly negative. It was a similar story in credit markets too where following two decent months of performance (on the back of the ECB CSPP announcement) May saw Euro indices eking out more modest gains of less than a percent in local terms in May with financials the relative outperformer. Looking at these in USD terms though results in most European credit indices down 2-3%. Performance was more impressive then for the S&P 500 (+2%) and higher beta US credit indices (+0.5%). Further afield the top of our May leaderboard is headed by the performance for Greek equities (+11% local, +8% in USD terms) which rallied following the latest positive developments with regards to the bailout. Thereafter its WTI (+7%) and Brent (+5%) which rank second and third, extending what has essentially being an ongoing rally since mid-February now. Corn (+6%) also had a strong month. Developed sovereign bond markets sit in the middle of the pack although with concerns about Brexit starting to abate, it was Gilts (+2% local, +1% in USD terms) which outperformed. Finally the bottom of the leaderboard sees Brazilian equities (-10% local, -15% USD terms) prop up the rest as the political situation came to a head. Elsewhere Gold (-6%), Silver (-10%) and Copper (-8%) all suffered with the Fed repricing. EM equities and bonds (-4% and -5% respectively) also succumbed for the same reason. Taking a look at year-to-date performance, it’s still commodity markets which are dominating the top of the leaderboard. Indeed in local currency terms the top five has WTI (+33%), Brent (+19%), Silver (+15%), Gold (+15%) and Corn (+13%) hogging the limelight, although if we flip to USD terms then Brazilian equities (+23%) and Russian equities (+19%) jump to second and fourth respectively. The impressive rally for the Yen (+9%) is still a standout while the overall performance for credit continues to be strong. Indeed in local currency terms we see US indices up between 3-7% this year, led by HY while European indices are up between 2-4%. There’s a familiar look to the bottom of the leaderboard with the Shanghai Comp (-17% local, -19% USD terms) the biggest outlier. Italian equities (-14% local, -12% USD terms) and European banks (-14% local, -12% USD terms) are still down double digits although have bounced back from how they ended Q1." Below, we present a list of key event risks in June courtesy of UBS. There are of course much more than what is included here, but these are what the markets will be focusing on for the most part. June 2016 is a month in which the number of event risks is particularly high. In our baseline scenarios we do not see market upsets, but the potential is there: Japanese fiscal policy; meetings of the ECB, Fed and BoJ; new ECB policy implementation; a German Constitutional Court ruling; the UK referendum; elections in Spain; and a decision on the FTT are all thrown into the mix. 1 June: Closing day of the Japanese Diet – new fiscal action? We expect Japanese Prime Minister Shinzo Abe to announce new fiscal policy on 1 June – the closing day of the current session of the Japanese Diet. We think that the scheduled rise in the consumption tax will be delayed and a supplementary budget of ¥5-10tn could be announced. It is also possible that the Lower House is dissolved and new elections called. On balance, we do not expect any change in monetary policy to be announced by the ECB, the Federal Reserve or the BoJ in June, but statements and guidance will be watched closely. First up is the ECB on 2 June. The ECB will present its new staff forecasts at the press conference. We think the key challenge for Mr Draghi will be to not appear too hawkish amid rising oil prices and robust Eurozone Q1 GDP growth, and we believe it too early for the ECB to send strong signals about the duration of QE beyond March of next year. But much will be discussed. After that, the FOMC will meet on 15 June. We think that it will wait until September before it next raises rates (in part because of upcoming event risk). However, the minutes of the April meeting and recent Fed rhetoric has kept this meeting “live” and expectations higher than they might otherwise have been. While we do not expect new ECB policy to be announced at the June meeting (see above), June is the month in which some already-announced policies are implemented for the first time. The first auction of the new Targeted Long-Term Refinancing Operations (TLTRO II) will take place on 23 June, with the publication of the results on 24 June. Market focus has been on the ability of banks to borrow 4-year money at an interest rate (to be set by ex-post calculations) as low as the current deposit rate of -0.40%. However, we think that more important will be the first voluntary repayment of TLTRO I to be announced at 11.00am London time / 12.00pm CET on 10 June. (The repayment itself will take place on 29 June, coinciding with the first settlement date of TLTRO I). It is likely that the bank repayment ofLTRO I will be larger than the take-up of TLTRO II – and result in the first significant reduction of the ECB's balance sheet since QE began in March of last year. In turn, this might appear as an involuntary tightening of monetary policy. The reason this might happen is that one of the effects of QE has been a largescale creation of deposits in euro area banks. But TLTRO I took place before QE was announced and banks have been unable to repay it until now. Many of them – particularly in core countries – have been burdened with large excess liquidity as a result. In turn, this has meant a drag on Net Interest Margins (NIM) for these banks as risk free rates have been negative while they are (by and large) paying 0% to depositors. Also in June, we expect the Eurosystem to begin its purchases of corporate bonds in its Corporate Sector Purchase Programme (CSPP). It is likely that this will begin in the days shortly after the ECB’s press conference on 2 June. The corporate bond market will be watching the implementation of purchases on a daily basis. We believe that once the CSPP settles in, the Eurosystem will be buying around €12bn a month in corporate bonds. Last Wednesday Reuters reported that – citing “several bank sources” – these will amount to €5-10bn per month initially. Some appear to think that a ruling against OMTs might impede the purchase of peripheral bonds in the ECB’s current QE programme. We believe this to be unlikely. Bundesbank opposition to QE as a monetary policy tool in principle (even if not in timing) seems slight. It is widely accepted that the announcement of OMTs in the summer of 2012 was the beginning of the end of the sovereign debt crisis in Europe. But in October 2014, the German Constitutional Court found that the policy was “incompatible with primary law”. At the same time, the judges in Karlsruhe passed it on to the European Court of Justice for review, which last year came to the opposite conclusion (though in the context of European law). The recent rally in sterling and the tightening of peripheral sovereign spreads have been widely attributed in the media to an increase in confidence that the UK referendum will result in a vote to remain. If correct, this would mean that there would be potential for sterling to fall and peripheral spreads to widen once more in a scenario where there is either a vote to leave or if opinion polls showed increased support for that outcome. Spain will hold another general election on 26 June, after its 21 December 2015 election resulted in no government being formed. In general, we think that Spanish yield spreads to Germany should tighten over the coming months as the relatively strong growth heals the economy and improves debt dynamics. However, Spain missed on its deficit targets in 2015 by a wide margin and is likely to miss again this year, according to the European Commission. In part, this can be attributed to the dominance of elections in the public calendar. But there is a risk to sovereign spreads if a government is formed after the elections which might take an anti-austerity stance and widen the public deficit even more. A group of European governments have been proposing a European Financial Transaction Tax (FTT) for several years. In the most recent statement, the proponent governments indicated that “taxation should be based on the principle of the widest possible base and low rates and it should not impact the cost of sovereign borrowing”. It should be noted, however, that aside from the 10 countries currently promoting the tax there is opposition among other EU member states, most notably the UK. Under the “Enhanced Cooperation” framework, the countries will pursue the policy only if 9 or more member states support it. In December, Estonia withdrew its support for the project. Deutsche Bank: "We See No Further Upside For European Equities..."
It seems like more and more of the big names are turning bearish on risk. Day after day of directionless trading, huge intraday swings in the equity markets, and a very confusing macro backdrop has bred a lot of frustration amongst investors and traders, ourselves included. We ardently advocate staying on the sidelines because we just don't know what is going to ensue. Yes, we have our own biases (with whatever we discussed about here, here, and here) but these biases aren't going to be beneficial in anyway unless the markets start trending again, which at this point is highly unlikely. The number one principal for both small and big players would then be to preserve capital and ride out the volatility.We prefer to stay very lowly exposed or not exposed at all. More and more are jumping on the "sell in May and go away" bandwagon but for good reason. As U.S. stocks base around in short term trading awaiting more cues about a potential June rate hike from the April FOMC minutes to be released later today, the big players have their eye on the bigger picture. This is something we've talked about on these pages, and something we buy, on the caveat that technical factors turn conducive. The month of May has historically heralded volatility in the financial markets. The key takeaways from Goldman are: Overweight cash, avoid equities, look to profit from up in quality carry, and perhaps buy some volatility. With the stock market heading no where for the last 4 months of this year, it is high time we took a step back and view things from a systematic angle. As we approach the "sell in May and go away" phase of the year, equity returns are looking more vunulrable to adverse shocks, and flares in volatility. YTD, the S&P 500 is almost unchanged, down marginally. 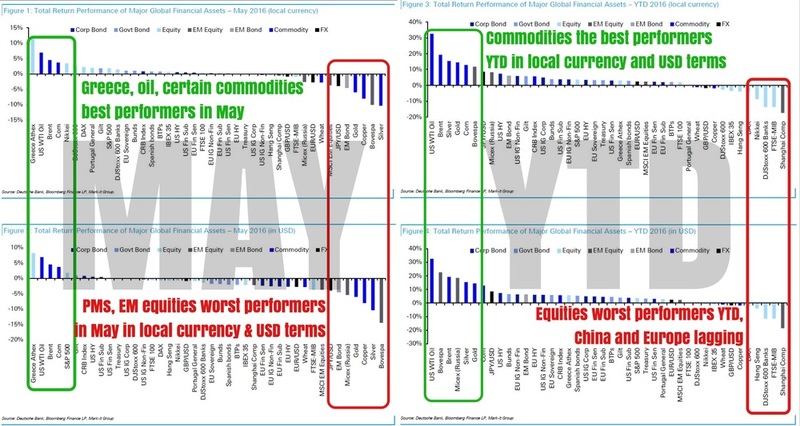 Bonds (quality) and commodities (short USD) have been the best performers for the last 4 months. Vol of vol (VVIX) has remained elevated but is not yet deemed to be at alarming levels. What's in store for us may be a surprise. Or actually maybe not. When we piece this puzzle back in a way BofAML calls the "3P's of Positioning, Policy & Profits", we can come to the conclusion that the risks are skewed south, and things could turn uglier very promptly. Therefore, it may be wise to expect very moderate returns from equities. One may wish to overweight cash, bonds, and gold while avoiding equities and non-IG corporate credit. Technology and mass robotization are probably the single biggest threats to our jobs. Jobs of both the blue and white collars are gradually being replaced by robots that are much more cost efficient and productive. Plus, robots have no want for minimum wages, or hold strikes in protest for what is now a huge skill deficiency in the labor force across the world. So will politicians and central planners dabble with the risk of upsetting the status quo for a potential change in direction? Unlikely. Rather, Janus Capital's Bill Gross believes central planners will stick to what they have always been best at: Printing money (QE), lowering interest rates or bringing them sub zero as we've seen recently, and fiscally stimulating economies with debt funded programs thereby creating a false impression of prosperity when there isn't. "30-40% of developed bond markets now have negative yields and 75% of Japanese JGB’s do" is how Bill Gross likes to drop some perspective onto the world that has become so numb to the new age central banking tool known as NRIP, or negative interest rate policy. It's absolutely perverse, and it's everywhere like how Vampire Squid has its tentacles all over political campaigns in America. Business cycles have become so influenced by asset price inflation, or in some cases deflation, that they have lost a good deal of traction with the more traditional Keneysian theory of aggregate demand and aggregate supply. Gross ultimately warns that if global economies continue to merely drift on stagnant waters, failing to see a breakaway renaissance in output growth, we might be in for a rude awakening when the chickens come home to roost. Eventually they shall. Read that again. Does the title make any sense? Just how did the ECB murder euro shorts with even more easing? The ECB has made its move this week. Even lower negative interest rates, more QE, and rhetoric that should all else equal send the euro tumbling to new lows. But exactly the opposite happened an hour after news hit the wires. Baffled yet? Well, most traders were. The stupendous volatility this single event has brought to the financial markets is difficult to overstate. Contrary to intuition, the euro (EURUSD) is some 420 pips north of Thursday's lows, making this one of the largest and most brutal intraday reversals we've seen in a long while. Yields on core European sovereign debt are all higher, instead of lower. Such moves make little sense considering how much looser monetary policy is now in the Eurozone. Or does it? Let us explain. 2016 is shaping up to be like the latter half of 2015 but with a lot of additional dynamic forces warping and twisting the financial markets. Higher than average volatility has been the common theme so far but we're also noticing an incredible rapid shift in cross asset correlations. All this means that the current market environment is extremely rough, giving traders (ourselves included) a hell of a hard time. It is no surprise that this is indeed the case. Policy uncertainty amongst central banks, oil prices that are stick in a moribund rut, very idiosyncratic technical flows that have caused traditionally lower beta assets to trade like mad donkeys, and of course the deep polarization of sentiment across the board. It is on this note that we turn to JP Morgan's quantitative desk for answers, albeit nebulous. The desk analyzes markets in a less traditional manner, approaching this landscape with mathematical and technical tools most retail traders have zero access to. While we are hard pressed for time, we feel we need to put this piece out to give readers a first glance of what 2016 might be like for the markets all across the world. We have a feeling 2016 may be markedly different from the past 5 years where cash might actually be the best performing asset. Yes, being in cash is a position in and of itself. In layman's speak, you ether go big or go home in 2016. At least that's what we think. You could make a hack a lot of profits or loose your shirt in the kind of markets we've been greeted with so far. So buckle up, sit tight, sell risk and buy cash. Central banks aren't stupid, they're just stubborn. The unintended consequences, a palpable word for not heeding the lessons of history, of zero bound rates have never been further reaching. Businesses lose foresight they used to have. Savers and pensions suffer the most because savings cannot earn a high enough return to justify the value of time and opportunity costs. It's all about the yield curve, which has never been as flat as it is today. Things have gotten so out of whack that even Gross himself openly admits that the 'necessary' changes will most probably not be effected. Entire financial systems have been built on this new paradigm. Unfortunately for the real economy, this new paradigm has hindered long term economic growth and stability. Will anything change? Perhaps not. Older PostDeutsche Bank: "We See No Further Upside For European Equities..."